You know this is an enjoyable thread, but its fricken killing me. 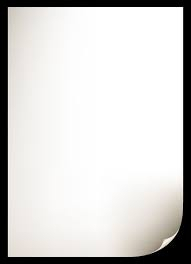 ALL THIS BEAUTIFUL PAPER WE CAN'T SEE! 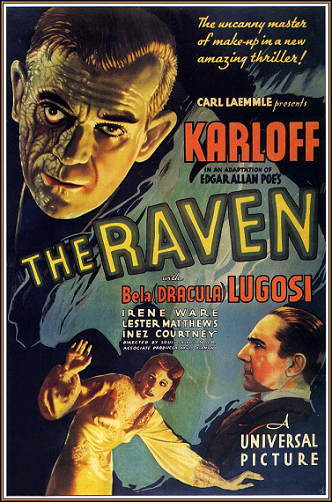 U.S. A. one sheet and lobby card of The Raven ( 1935 ). 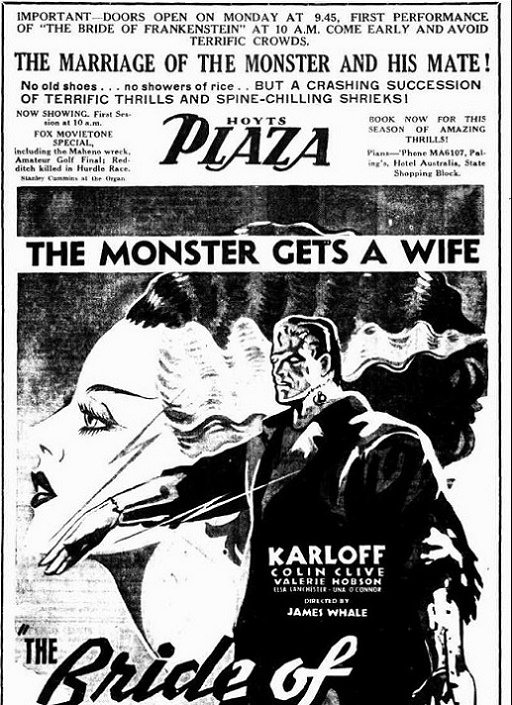 An Australian newspaper advertisement from 1935, with a similar image appearing on it of Karloff that appears on the U.S. lobby card. Once more hopefully one day an image of an Australian long daybill will surface. Adding Mark's first release Australian advertisement image with my earlier posted February 22, 2018 information, so they can be viewed together. 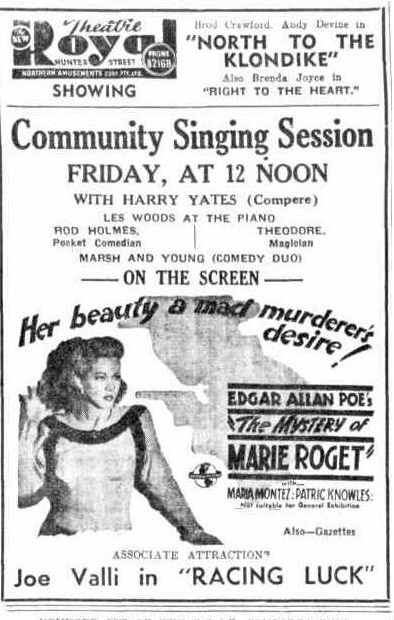 Still more classic Universal Horror titles that are missing daybill images. Limited number left to cover, but they are famous titles. I left some good ones to last. 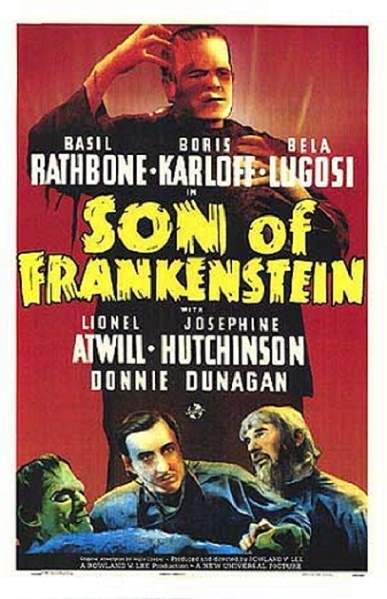 Son Of Frankenstein ( 1939 ). 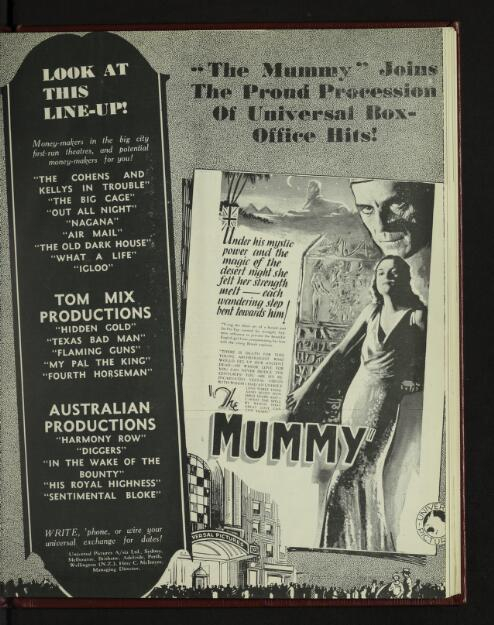 Above is a U.S. one sheet and a newspaper advertisement from the release in Australia in 1939. 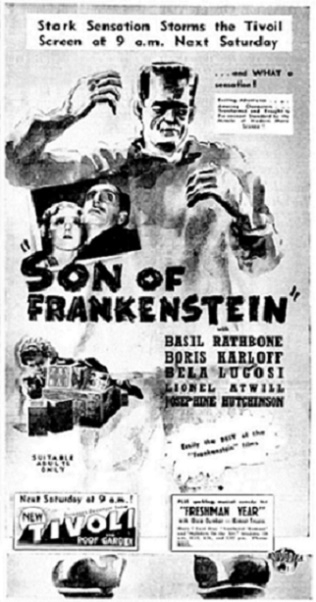 The missing Australian daybill would have been a long daybill, and most likely a great design printed by Marchant and Co.
Another grouping together of two previous entries of Son Of Frankenstein images. 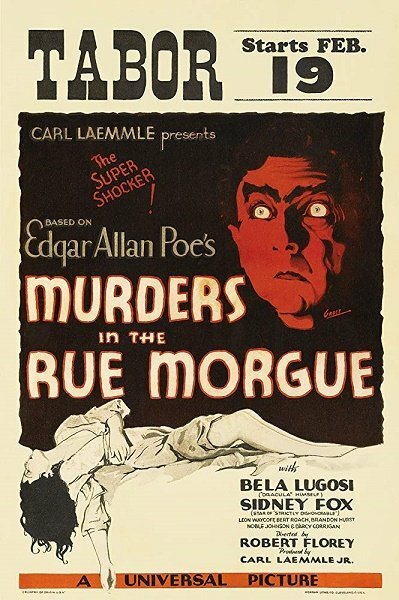 Murders In The Rue Morgue ( 1932 ) U.S.A. window card and a very rare poster, and other original release posters, apart from lobby cards and 8 x 10 black & white stills, are almost impossible to locate, including a U.S. insert and the 3 sheet. 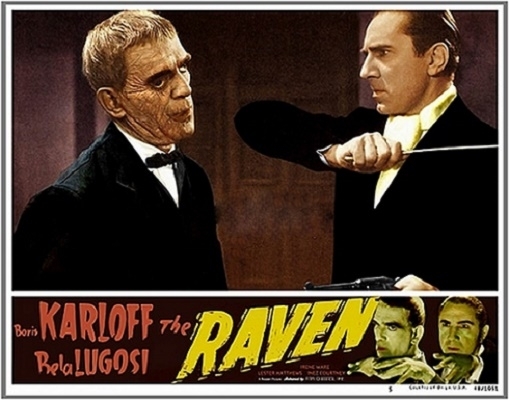 The Realart / Film Classics 1948 re-release poster images are easier to come by. 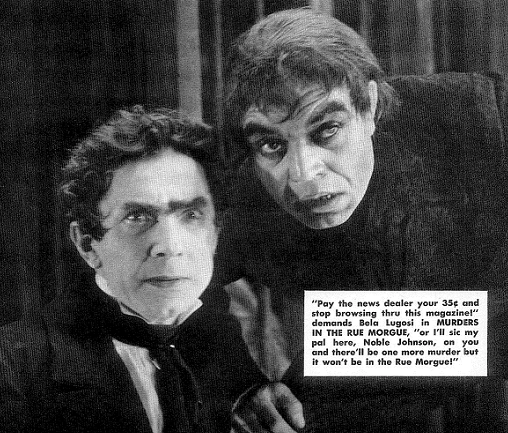 An original Australian newspaper advertisement placed in 1932, using unusual artwork of Noble Johnson the actor who played Janus, The Black One in the film, along with a rare piece of undated publicity material featuring Noble Johnson with Bela Lugosi. Hopefully an Australian long daybill still exists and will surface one day. 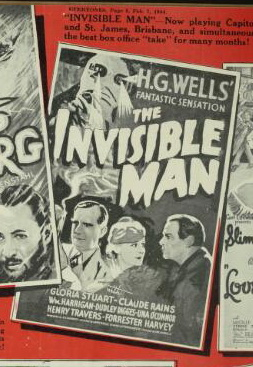 The Invisible Man ( 1933 ). I have included this film here as it is listed in many Horror listings as being a horror film.To me it is a mixture of genres, but predominately to me it is science fiction. The original daybill I feel would have been spectacular. I couldn't locate an original U.S. A. insert or 3 sheet, so the above U.S. one sheet and the Australian newspaper advertisement are all I have to display here. 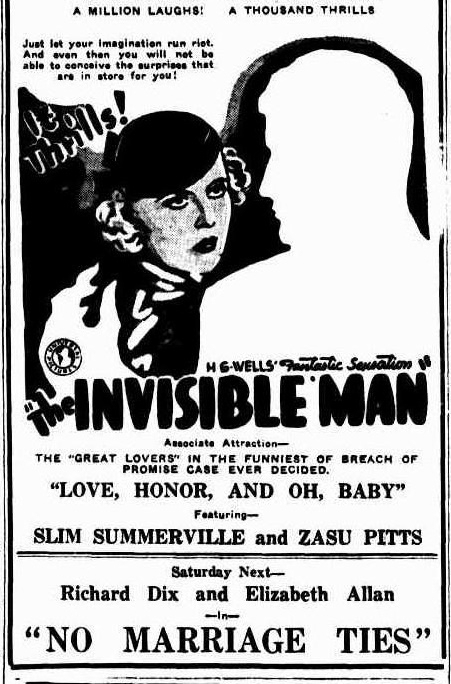 If a daybill was to appear I am sure it would be very much in demand, both here and overseas, and it would attract a substantial amount of money if offered for sale. Another rare U.S. poster and a story from a 1932 Sydney N.S.W. 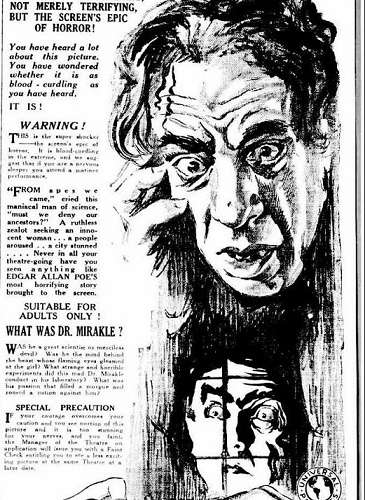 newspaper regarding some banning of the film in Victoria and Tasmania. One of the best and probably one of the most desirable horror titles. 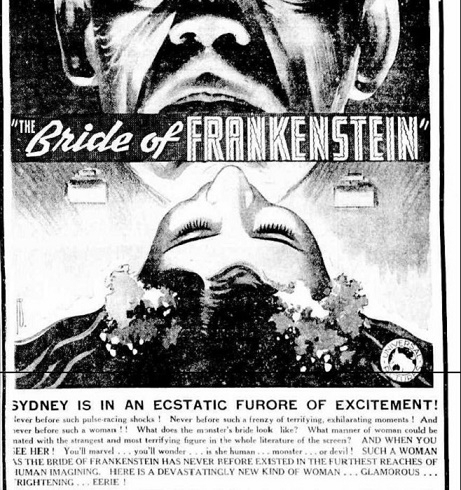 The Bride of Frankenstein ( 1935 ) U.S.A. insert and two lots of original release 1935 Australian newspaper advertisements. The mind boggles when one thinks of what the original long daybill may have looked like. 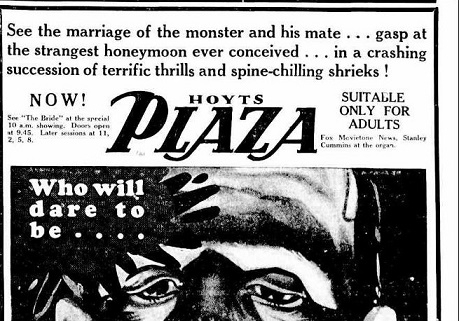 I had left this title to last and this should now cover all the Universal horror films from their heyday period from the 1930's and 1940's that are missing Australian daybill images. I hope you all enjoyed this thread and if any of the still remaining 22 missing titles that I have listed as missing turn up please let us know and post some images here on this thread. 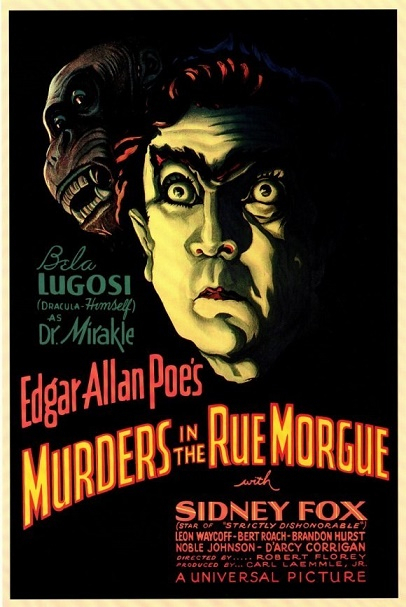 There are also five titles from the 1930's and 1940's that aren't horror film that are sometimes credited as being so. Let me know if anyone is interested in me covering those as well? Due to not a single person replying to my question, it seems obvious, to me anyhow. that there is no little or no interest for me to cover the five films with the dubious horror film credentials that I thought I would include in this thread. What is this book you have in your hot little hands Ves? Fantastic work on the Dracula! 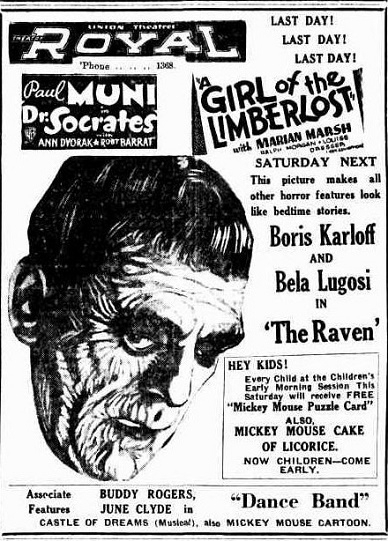 That daybill appears to top the Frankenstein we know is extant. Mark put me onto an early aussie publication called Everyone's. Trove recently digitised an almost complete catalogue available through their site. So when I have some time, and can remember I have taken to browsing through to see what I can see. There is some great stuff in there. Ves, I will get them to you at some stage or another. 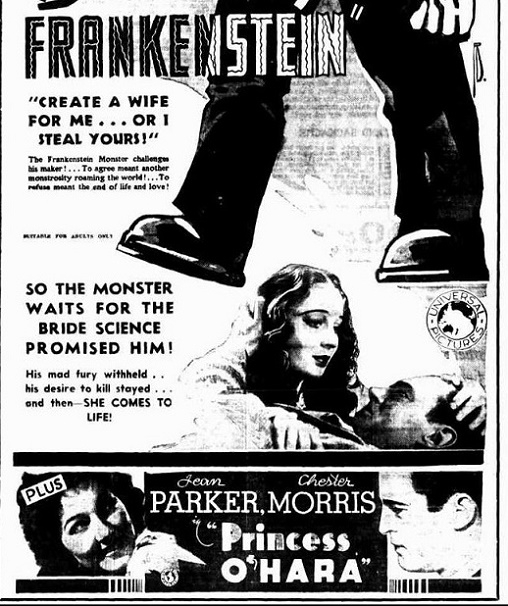 There was rumour of an Aussie Bride of Frank one sheet for sale in a Blue Mountains antique shop years ago. Apparently Phil raced to the shop but it was already gone, if it ever existed. Agree with Ves a great resource available. 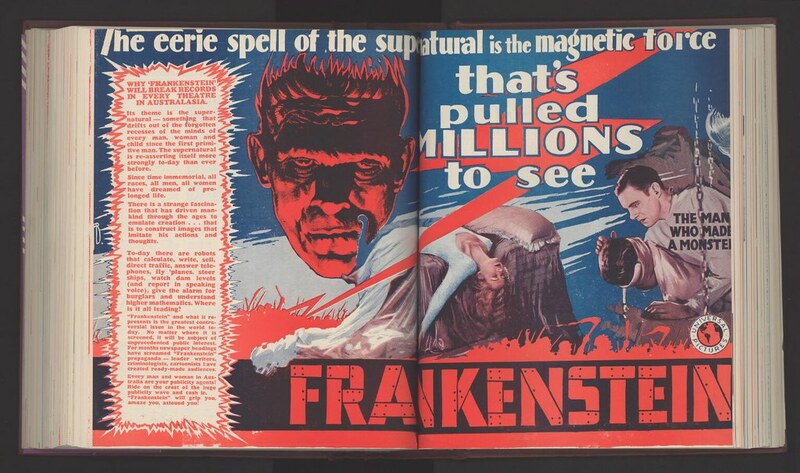 Everyones became Film Weekly, running up to late 1970s as a cinema trade publication. 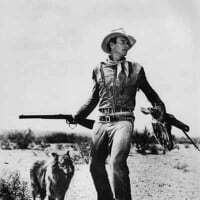 There will be ads and info for just about every movie discussed on this forum. Best resource we have and I'm glad to hear it is finally being digitised. Chris can access the site himself. Not missing, but this article should keep Chris happy. That's great Mark thanks for posting. Even has some of the daybill elements in it. 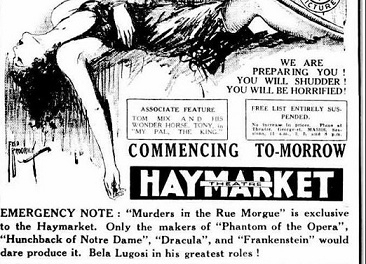 Found some great stuff in Everyone's including White Zombie and Murders in the Rue Morgue (could not specifically locate posters but nice trade ads and theatre displays etc.) Awesome! Is it just me or does it look like 2 more daybills are framed and hidden on the left? The mind boggles! There seems to be virtually nothing apart from one review of Bride of Frankenstein in Everyones (disappointing and perplexing). Not just you...definately there...and probably more than two...can only see two. I also found images of window displays that look like they have some daybills too. Hopefully at least 1 survived somewhere! 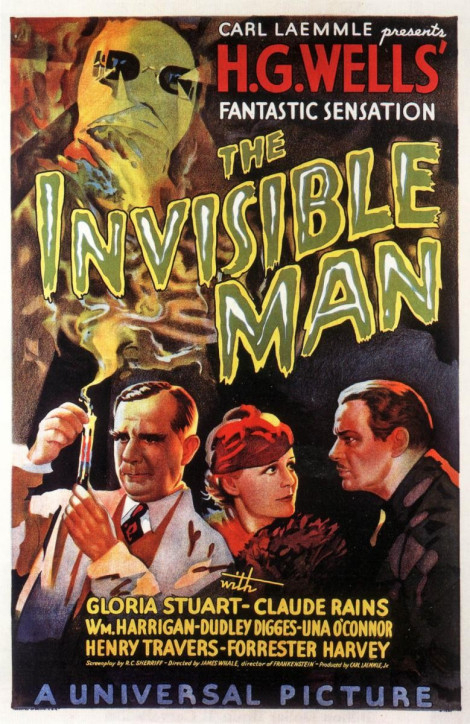 Just to tidy things up, for the record, the titles of the five films sometimes credited incorrectly as being horror films that I had previously mentioned are - Night Key, The Invisible Woman, The Mystery Of Edwin Drood, The Mystery Of Marie Roget And The Secret Of The Blue Room. Was only familiar with a couple of the titles you mentioned so I looked up the others. Seems to be some call to at least some of them being horror...but most seem noir. Poor Chris. When I have time to look around, will see if I can find anything. Would love to see the long daybill for Night Key!